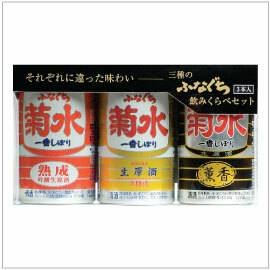 Featuring 3 of the most popular Sake from Funaguchi series, this tasting pack is ideal as a gift. Ginjo Nama Genshu aged at low temperature for over a year. Since it hasn’t been pasteurized, it allows enzymes to develop heavier mouthfeel and rich generous character. The very first nama sake sold in Japan. Sake has been canned without pasteurization which keeps this sake fresh and fragrant. Premium Funaguchi blended with their own “sake lee shochu”. Full bodied and rich flavor with distinctive noble aroma and umami.